If you make music or follow artists like Daedelus you’re probably familiar with the Monome, the grid based OSC controller that gave birth to new ways of composing and performing music. 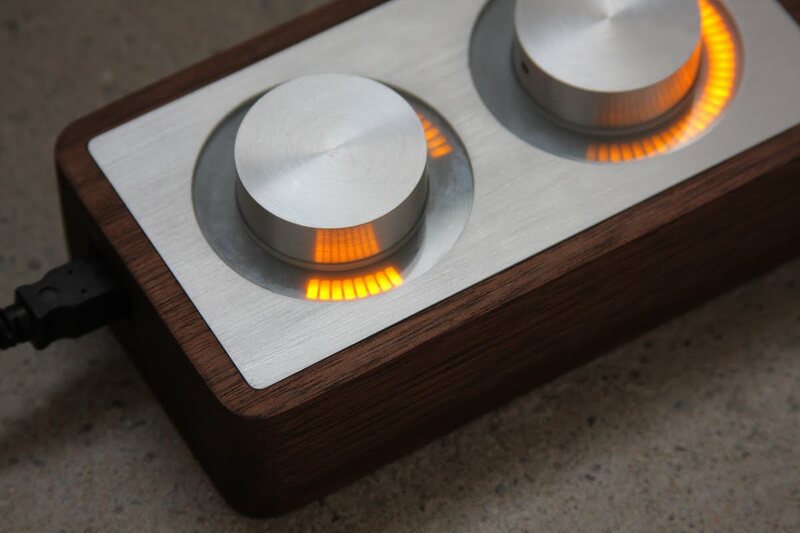 The same people that make the Monome are back with a new controller, this time in the form of the Arc, a high-resolution OSC controller with two knobs which double as push buttons. 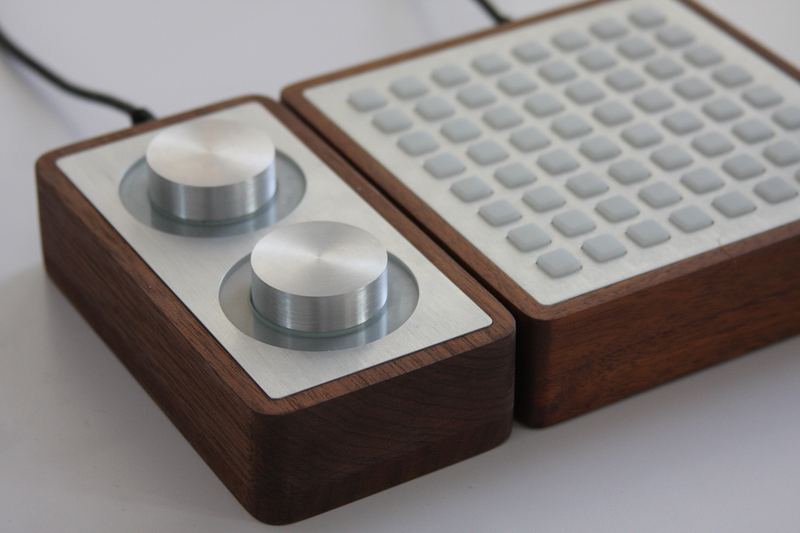 Like the Monome before it, the Arc is beautifully designed, outfitted in the signature walnut/aluminum casing. At $500 I can tell you right now I’m not getting one, but the Arc sure is pretty to look at; that led ring is absolutely stunning. Whenever I see an elegant interface like this I’m always left to wonder why we don’t have more control surfaces for Photoshop (I know people have found ways to control Photoshop with midi but I’m talking purpose-built controllers). Really, if Adobe were to open up to native osc or even midi support, we’d be off to a running start with all the pre-existing musical devices out there. This object makes absolutely no sense to me, save for the pretty aesthetics, especially at that price. An iPad or any non tactile device will never be the same as playing an mpc style pad for beat development. Don’t underestimate the power of velocity. I agree with you that in terms of bang for buck you can obviously do a whole host of things with an iPad that you can’t do with a monome or the similar launchpad offered by novation. But I’m a minimalist – so sometimes less is more. Regardless of the price. 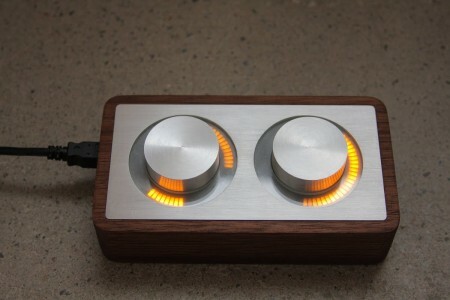 An official MIDI interface to Lightroom/Photoshop/Aperture would be awesome. yeah, on stage in particular, you need tactile feedback. touchscreens can work for certain applications, but with my live set, for example, I need to be looking at other things while using hardware interfaces, I need to be able to feel the controls so I can do multiple things at once (like play keyboard and control vdmx, or manipulate parameters in live without looking at the screen or interface, you can know by feel where the knob you need is) At home or in the studio, this becomes less of an issue, but I do prefer to work with tactile devices there too, it’s just more intuitive and I feel I have better control. But I do agree that these are over the top in terms of cost and build. You can get an APC40 or a launchpad for a fraction of the cost and both can be made to emulate the functionality of the monome. That being said, both of those examples are made of plastic. this is a hand built, boutique item, made from metal and wood. It’s not produced on a production line in China, it’s made by it’s creators in Philadelphia. none of that comes cheap and there’s always going to be someone who values those things enough to pay top dollar for something like the monome. I’m not even close to being any type of music maker. Still, I want that in my office. Couldn’t agree more with the value of a well crafted item. I currently use a launchpad for my Ableton Live work – but this is mostly because I fly constantly and it’s nice having this fairly indestructible plastic pad I can throw in my bag without much cause for worry. Though I can’t tell you how much I drool at the prospect of having a monome that can sit in all it’s glory on my studio desk ’til the end of time. The other side of having a dedicated midi device that isn’t an iPad is that you’re not tied to an OS. As cool as the iPad is – it will be outdated. Soon. A really kickass midi device that can be mapped to multiple applications? That is sustainable. Which is all the more reason to get something well crafted and beautiful. I would venture to bet that you’ll see more monomes sitting on desks (and still in use) in 10 years than first gen iPads. all true. I am just hoping OSC gains more widespread acceptance. it isn’t even native in ableton yet! that seems crazy to me. luckily we have Osculator. $250 per knob? No thanks. Wow, it’s like watching a Loscil song in development. Anyway with regard to the design, it’s cool, but on a trendy level. There is a level of refinement missing for it to be completely Dieter Rams timeless. It seems too formulaic. It’s not elegant, it’s just blank. That being said I’m a sucker for knobs these days. Don’t get me wrong, I actually agree with you on the tactile side of things. But the again, for this I have a MPK49 with 8 knobs and as much faders. As for the made in china vs. hand built in the USA, I’m also very sensible to this, being an avid purchaser of hand made, boutique guitar pedals. But when I do buy one, I don’t ONLY buy it for aesthetics/provenance. I buy it because it also has something unique in the way it’s working, in the sound it produces, etc. Hmm. While I agree that the functionality vs. cost of the Arc seems unbalanced (the video, while interesting, could be more explanatory) the monome is a different story. It is an open source piece of hardware that’s functionality is only limited by your imagination – and programming ability. Now I’m no programmer but there are a plethora of applications available for the monome and more come out every day. You can use the thing to water your garden for chrissake. Beyond it’s ability as a sample manipulator, I have never seen a Launchpad come close to a monome when it comes to acting as a non-linear step sequencer. As for the cost, I built a monome kit for under $350 Canadian. That includes a milled aluminum faceplate I had someone make to monome spec. Some walnut and a woodshop and presto. 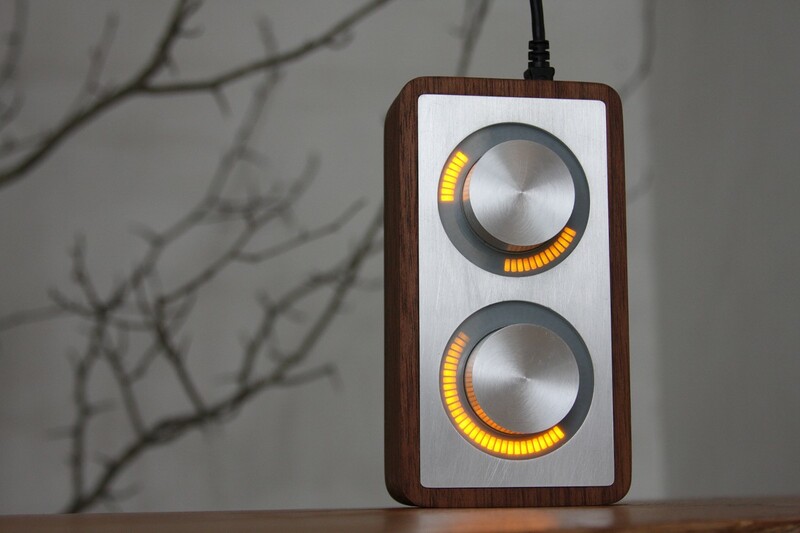 The minimal aesthetic of the monome is part of it’s functionality and versatility – it is meant to be a blank slate. MPK49s, iPads, and Launchpads, as cool as they are, are already regular pawn shop dwellers. I have a feeling that the monome is like a pair of expensive well crafted boots; economic in the long run due to the quality of the craftsmanship and the timeless unadorned aesthetic. As much as people are saying that the iPad isn’t great for this type of stuff, what are some Apps I could look into that would be similar to what I’m seeing in this video? Are there any? Are they complicated? I like this type of music and would love to have a try at it. the thing about the arc is its expanding potential. its much more than a knob to send 0-127 messages, it has opened up a whole new world to interact with max/msp patches the monome community writes. as you can see in the video, brian is using the arc as a looping device while triggering through the monome. the visual and tactile feedback of the arc is something nothing can really accomplish. yeah you can grab a bcr2000 and call it a day, but the arc isnt made for the same purpose of those rotary devices. i own two monomes, the walnut 64 and a grayscale 128. best investments i’ve ever made, hands down. i’ve played with multiple different monome emulator and/or grid based button devices that never really compared to the feel and obvious superior looks of the monome. the usability is one of my favorite things, regardless of the endless forum threads with people who complain that it doesn’t make sounds after they plug it into their computer. the community is also really helpful and has it’s own personality that none of these oversea asian companies can touch. made in the US by good people for a fairly reasonable price. they can’t be beat. Is this something you would recommend for a newbie just getting started with synth? As it is now I have been recording my music via Pro tools with just me and my guitar with some digital bends and putting tracks together with Garageband, etc. Trying to familiarize myself with the transition. Although its a steep price tag I am willing to pay $$ if its worth the time. Just looking to start somewhere and take things a little more seriously. The design isnt that bad I actually enjoy its physical features a great deal. Its soooooo expensive.. But its soooo awsome.. Isnt there like a three month waiting period for this stuff??? I have to say that while this thing looks nice I have to agree that it does seem to have extremely limited functionality which at the end of the day is the entire point of controller equipment. For me the best bit of design in audio gear for the last 3 years or so has go to go to Native Instruments Maschine which is perfect in both form an function to my mind.